For those of you who visited back in the early days of the Shrine, you’ll be well familiar with my grief at the career-trajectory of Mrs. Jennifer Anne Garner-Foley-Affleck. She, who I so adored as Sydney Bristow for at least the first couple of seasons of Alias, and who I thought was so winning in 13 Going on 30. Then came some unfortunate choices, e.g. : Daredevil, which was seconded with Elektra, and that epic too anemic to play on the Lifetime for Women channel, Catch and Release (- mercifully euthanised, here). I worried, folks. I didn’t want this actress who I had such hope for to go meandering down Aniston road. And after appealing to deities better connected than myself, I’m pleased to report that my fears were unfounded. In Juno, Mme. Garner has found a showcase in which to display the charm and talent I knew was in there. My impression of the opening moments of the film weren’t particularly favourable (- despite neat opening credits). We first meet Juno guzzling down gallons of Sunny Delight as she narrates the events that lead up to her requiring multiple samples of a pregnancy test (- “It all started with a chair”). The ultra-hip and ruddy unlikely dialog of these first scenes made me wince. Let’s take the words of wisdom Juno’s pharmacist imparts after no amount of shaking the stick will change the plus sign, “That ain't no etch-a-sketch. That's one doodle that can't be un-did, homeskillet” Homeskillet. Was I meant to sit for the next 90 minutes and be dazzled by every quirky, precocious, oh-so-clever line? I wasn’t looking forward to an hour and a half of rapid-fire, latter 20th century pop culture references spouting from the mouth of a teen that wouldn’t have been a plus sign herself until somewhere in the last decade of that era. It all seemed very contrived and callow and the nonstick, mannered delivery by Ellen Page in those scenes only emphasised the point. 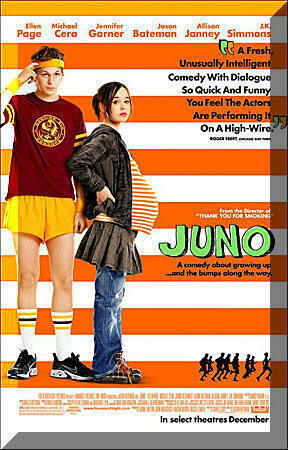 Luckily, somewhere around the half hour mark, Juno – both character and film- begins to show some heart. The more we see of Juno’s interaction with her friends, including her best pal, Leah, and Bleeker, the cause of her Sunny D diet, and Juno’s involved and loving parents, the more the blitheness of her patter and her character takes anchor. Juno decides against her original plan to have an abortion, and finds a couple to adopt her baby. Accompanied by her father, Juno meets Mark and Vanessa Loring, a young, Yuppie couple who seem to have everything except the baby they so desperately want - or at least that Vanessa so desperately wants. Juno forms an attachment to Mark and the two embark on a friendship that seemingly worldly Juno is too young to realise is inappropriate for a young woman about to deliver a baby to this man to father. Little by little cracks begins to show in all aspects of Juno’s life. As her pregnancy advances, Juno’s walks through her school’s corridors resemble the parting of the Red Sea as her schoolmates rush out of the path of her burgeoning belly. Juno’s contentedly platonic relationship with Bleeker becomes a complicated mess of hormones once Juno realises her true feelings for her geeky stud. Top it off with the harsh discovery that all is not as well with the picture-perfect adoptive parents as was originally thought. Juno’s presence in Mark’s life unknowingly triggers an early midlife crisis as they find musical common ground; Juno’s taste for 70’s rock meshes with Mark’s abandoned aspirations of grunge greatness. The waddling Juno represents lost youth and the onset of real adult responsibilities to a man who still wants to be Peter Pan. Vanessa also sees her hopes in Juno; anxious and trepidacious after suffering through a previous unsuccessful adoption attempt, Vanessa’s desperation for the baby that Juno carries takes over her life, as she tells Juno she is simply “meant to be a mom.” While Vanessa purchases enough infant items to fill up twelve baby showers and obsesses over paint swatches for her prospective child’s prospective room, Mark chooses this particular time to make a life-changing decision that throws everybody out of orbit. I didn’t love the pat, non-explanation of why Juno chose to run out of the abortion clinic (- a distasteful episode in the waiting room regarding blueberry-flavoured condoms) and the way the only issues we see affecting her pregnancy are frequent urination and a deeper love of fast food, once Juno has to face the possibility that she may not have made the right decision after all, does she seem real.